Boostzone Institute aims at being a reference research and training institute on the future of the World of Work as it impacts corporations, their strategies and their organization. Founded in 2004, the Boostzone Institute stemmed from the will to understand and forecast how the evolution of our society and in particular the World of Work – affected by major forces like the emergence of new technologies, of new social dynamics, of new economic conditions — is going to bring a sea change in the strategy and management of organizations. Most research centers and most management academic institutions are late in understanding those impacts and translating them into practical implications for corporations. For instance, revolutions such as the ones of social networks, big data and digital, 3D printing, new materials, platform economics, CRISPR, etc. take several years before executives become aware of them and of their impact on their business models, social models, marketing models, production models. The founding members of the Institute are all professionals of Corporate Strategy, Human Capital management, Networks and Community management, and Technology management. In essence, the Boostzone Institute is a community of leaders, senior executives and experts who believe that major forces are transforming the economy and society in fundamental ways and that executives should work now on their consequences. Studying the forces at work and their impact on the world of work and corporations is not futurology, it is strategy. The Boostzone Institute focuses on business transformation issues. We strive to build a shared understanding of how vertical organizations of the industrial age can be made to morph into global-networked organizations, socially responsive organization, human-capital based organizations. Our goal is to help our members create sustainable competitive advantage in their organizations and develop their practice of Network-Centric Management through a better understanding of the evolution of the World of Work. The Boostzone Institute is a collective intelligence community where members share their experience and build on them, making progress together and assisting each other in the complex task of transforming their organizations. Boostzone Institute’s R&D works on a nonprofit base, the various components are financed via sponsorships from various companies, in cash or in kind, and out of the profits of the consulting activities of the Boostzone Institute. How to forecast technology change and to stimulate innovation? How to use neurosciences in practice? Evolution of our various projects are regularly posted on our blog. Mini laboratories around major unfamiliar but important topics that we believe should be put clearly on the radar screen of leaders. We organize thought-provoking presentations and collective intelligence sessions. The knowledge of all participants is shared, captured and outlined in reusable working documents. One day laboratories where senior executives, on invitation only, share their views, after having set a “common platform” of elements on the selected topic. These laboratories may be followed by a publication but the precise content and the identity of participants is kept confidential. Technology, social and economic watch. We monitor an intelligence community that follows and comments emerging trends. Sponsored Projects. We organize specific knowledge-sharing meetings and/or research around specific business issues for the benefit of sponsoring organizations. Our value-add is our ability to gather some of the best experts and to produce a high-quality collaborative experience. Training, as we conceive it at Boostzone Institute, consists in helping executives to improve their understanding and develop their skills around the most innovative areas of management. Our programs cover both strategic approaches and highly practical issues. Internet, and a society now largely oriented around the notions of collective and participation, impose a new series of management skills. Executives have to manage their visibility, the development of their teams in an open world, the mastering of a collaboration culture. They have to understand the nature and the management implications of some of the major current trends within the economic, social and technological worlds. Most of our programs can be delivered in English. We organize training and collective research sessions for major corporations, and occasionally on a multi companies’ basis. They can be found on the training page of our website. They can be delivered in French or in English. Documents, books and Library. We provide our members with the (curated) latest research and documentation on our field. We regularly publish research documents. Every month, we release an updated version of the ‘Must Have’, a database of seminal documents. The ‘Must Have’ is a collection of important documents carefully selected on main topics of Augmented Management. It’s exclusively reserved to our members. It furnishes references readings with their links on the Internet. It represents the quintessence of our curation effort. 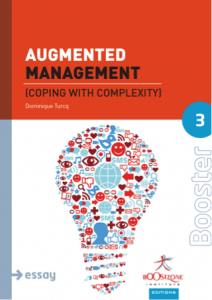 Our publishing house, Boostzone-Editions publishes thought-provoking short books (the Booster series) in French and English on advanced management concepts. Multidisciplinary and open on the world, this collection aims to decipher, investigate and illustrate the weak signals and basic trends of planet work. A Booster is a short electronic book, readable on all smartphones, tablets or e-readers, written for busy executives in order to help them challenge conventional ideas and enrich their thinking on the planet work. Authors are all seasoned experts in economics, management, technology or sociology who have accepted the challenge to write provocative ideas in short formats. A Booster can be read in less than 60 minutes. These ebooks are available in ePub and in PDF and for some in paper format. They can be ordered and uploaded at any electronic bookshop. Our Blog is in English and in French. It is the public and visible part of Boostzone Institute where our community communicates and shares their knowledge. Le Cercle is a private group reserved to our members. The discussions are curated and monitored in order to avoid all spams. Furthermore this group tries to limit the number of posts exchanged to max 3 a week. Towards Augmented Management is an open group for all those interested in our activities and wanting to interact with us and with their peers. The discussions are monitored but may reach more than 5 a week. Boostzone Institute assists corporations, mostly large multinationals, on their strategic foresight, strategic plans and organization issues. Our references can be found on the reference tab of the website. We do not advertise our clients nor mention them in conferences or training. Dominique Turcq is our President and Founder. He is an internationally recognized authority on the future of the world of work. Before founding Boostzone Institute, he was a permanent professor at HEC, ESCP and at INSEAD; he worked as a McKinsey partner in many parts of the world and in particular in the Globalization practice, the War for Talent practice and the Family Owned companies practice; he directed strategy at ManpowerGroup as SVP Strategy global. 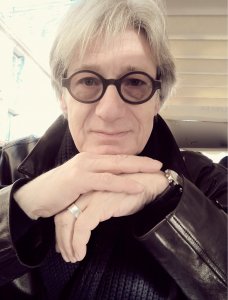 Dominique Turcq is closely associated with several multinationals on their strategy formulation as it relates to the world of work. Today infobesity makes us look like those bodybuilding champions, over equipped with muscle all over their body, unable to really use them. We handle too much information; we are unable to master the flow of them because they are indeed all relevant (irrelevant information is easy to handle: dustbin). We don’t look for needles in haystacks anymore, we strive to make sense out of those packs of needles (i.e. interesting and relevant information) we get every day. We need to loose muscle in order to be human again. We need to accept not even seeing some information. A hard issue in a world were information ownership was synonymous with power for centuries. But without “deleveraging” ourselves, we become less and less available for our real tasks in developing people and competitive advantages. Today’s time management stresses us, making us also stress others, 24*7*365, thanks to Smartphones and an often largely exaggerated (by us) sense of urgency. We need to control time, our time, back. Today we are so skewed toward enhancing shareholder’s value that we sometimes forget where we stand on deep ethical values and societal responsibilities. We absolutely need to reinvent trust, ethics and respect. We also need to reinvent capitalism, at all levels including in (our) daily work. Many of us believe that the leader of today can still be a Renaissance man, mastering most of the required knowledge and leading others towards a bright future. But obviously, we master less and less. It is also apparent that few of us have a clear understanding of what a bright future could be. We don’t have to master everything; we need to accept that our teams, networks and many tools can actually augment us without us controlling them. The use of Apps on our mobile tools follows the same logic: we don’t know how they work but we are glad to use them. Accepting this means having to give up our earlier vision of omniscience and superior skills; we are not superheroes. Manage and develop individuals and teams in a world of scarce talents (along high unemployment and explosive social settings! ), of swarm work, dispersed teams, individuals equipped with their own personal brand to an extent unknown until today outside of the “People” sphere. Manage not only the environment footprint of his/her unit or corporation but also the social footprint, the ethical footprint and the business footprint in a world where transparency and consumer’s power are threatening to have Jasmine flowers blooming all over. Manage the overabundance of information by selecting what he is really interested in leaving aside what is irrelevant while accepting serendipity and remaining curious and open to the world at the same time. Live in a permanent ß culture where projects and changes are all tentative by nature, inevitably changing sooner than expected. The Augmented Leader needs cultivate a deep and benevolent understanding of the world and of others. The new tools, including digital and neuroscientific ones, will help him because they allow him to be connected and technically enhanced, yet he will succeed in being augmented only if he uses them and not be their victim.